At Utility Analytics Week, Space‐Time Insight, the leading provider of next‐generation situational intelligence solutions, today announced that it has raised $14 million in Series B funding to speed adoption of the company’s innovative geospatial and visual analytics software. Three investment funds focused on emerging companies active in the energy sector, EnerTech Capital, Novus Energy Partners, and ClearSky Power & Technology Fund, join existing investors, Opus Capital Ventures and Start Up Farms International (SUFI), in this round of financing. 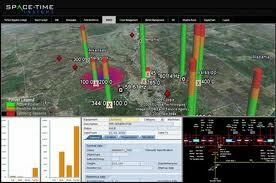 Space-Time Insight’s award-winning software uniquely helps its customers reduce risk, improve service reliability, and maximize shareholder value through sophisticated visualization and analysis of massive volumes of diverse real-time and historical data. The proceeds of Space-Time Insight’s second round of financing will be used to enhance the company’s suite of situational intelligence solutions and expand its sales and marketing activities in the energy and other capital asset intensive industry sectors. With this round of funding, Space-Time Insight also adds Novus Founding Partner, Martin Aares, ClearSky Power & Technology Fund Managing Director, James Huff, and Tucker Twitmyer, to the company’s Board of Directors, strengthening an already deep bench with individuals distinguished by their successful track records supporting early-stage innovators in both new and traditional energy markets. Space-Time Insight transforms vast quantities of disparate information into intuitive visual displays that businesses can use to make informed real-time decisions. From traditional transmission, communications and transportation networks to Smart Grids and Cities, our next-generation situational intelligence solution is making critical infrastructure smarter, safer and more reliable. With Space-Time Insight, enterprises can visualize and analyze their resources across location and time, rapidly respond to disruptions in service, and lower risk while increasing customer satisfaction and profitability. Major organizations around the world rely on our high performance software to gain actionable insights into their businesses and make real-time operational decisions. Space-Time Insight’s partners include Accenture, EMC, HCL, IBM, OSIsoft, SAP and Wipro. Space-Time Insight is privately held and based in Fremont, CA. For more information, visit http://www.spacetimeinsight.com.